At Eczemaliving, we exhibit the different eczema pictures of the people suffering from mild to severe eczema from all around the globe. Hands and feet may be a prime target for eczema in winters or summers when the air is dry. The skin loses its moisture and becomes dry to cause skin inflammation. Eczema includes dry patches of skin, irritation, inflammation, peeling skin and cracks on your fingertips. The peeling and cracking of skin may resemble sunburn or blisters. One of the best things that you can do is to see a doctor as soon as the eczema-symptoms arise. Your doctor can perform various tests to determine the allergens or irritants that are causing the skin condition. Doctors may recommend antibiotics, corticosteroids, cold compresses and more to use on a daily basis. Try keeping your hands and body moisturized twice or thrice daily in a normal routine too. Facial eczema may have a similar appearance on the face as in other areas of the body with the skin inflammation, irritation, dryness, redness and sometimes this may get worse to weeping and cracking of the skin. The skin on the face is thinner than the skin on other parts of the body and is more sensitive to the allergens. 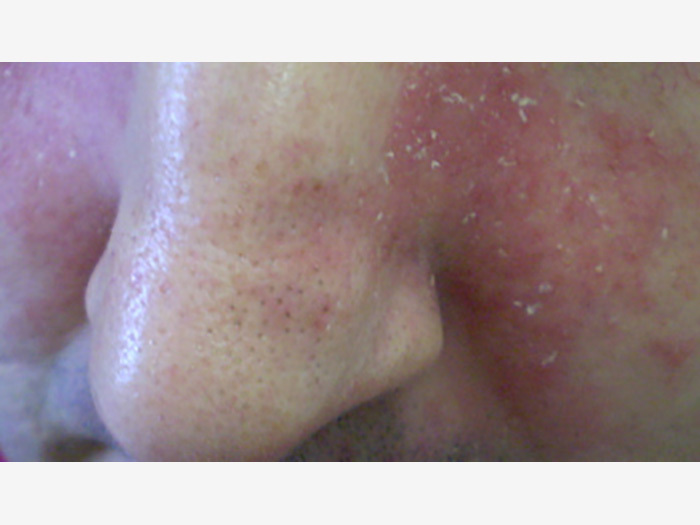 Facial eczema can be triggered by cosmetics and environmental allergens. Soothe your skin with the products that are mild on your skin and are only prescribed to get rid of the skin condition. The treatments for eczema on face relieves itching, reduce skin inflammation and flare-ups. Some treatments may include self-care measures while the others may be prescription based depending on the intensity of the eczema flare-ups. Consult your doctor immediately if you find the symptoms of eczema getting worse day by day. Read More about – How to Treat Eczema on Face? Ear Eczema is extremely frustrating and irritating skin condition. It majorly affects the pinna (visible part) and ear canal that can be easily characterized by flaking, scaling, inflammation of the skin. 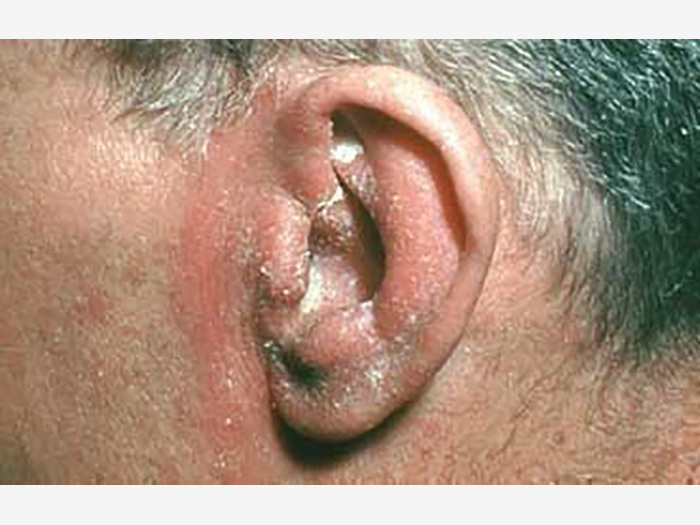 Also, the target area for ear eczema in people having atopic eczema is at the junction between the face and earlobe. Although it’s difficult to get the proper cause of eczema in the ear, however, this can be mainly caused by exposure to cosmetics, aeroallergens, and jewelry. A skin condition can affect any age group that includes adults, children and infants. Perhaps you may not know that you are not only the one suffering from the same condition but there are many worldwide. With proper medications and remedies, you can manage your skin condition. Eczema is a skin condition that cause the skin to become red, inflamed, dry and itchy. The dry patches can be seen all over the body but most prominently on the neck, elbows and thighs. The dry skin causes itching and gets the condition worse. Avoid triggers and allergens to get rid of the condition. Immediately seek for a medical help and try changing your daily regime. Include foods that are beneficial for itch control and manage the skin condition by the daily regimes prescribed by your doctor. Most common type of eczema is seborrheic dermatitis. 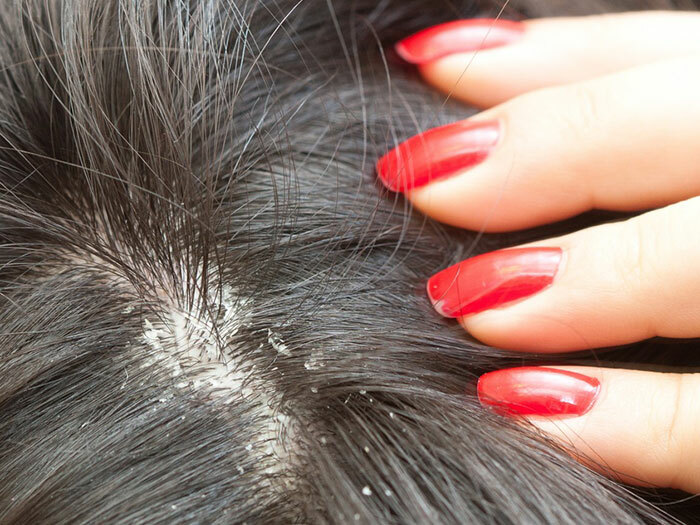 Scalp eczema is a type of eczema that causes dry, inflamed, itchy, irritated and flaky skin. The skin condition can affect any age group ranging from infants to adults. When a baby’s scalp gets the same symptoms it’s often termed as cradle cap. The treatment methods may include natural, medicated remedies and self care daily regime to get rid of the condition. It’s important to manage and control eczema as soon as possible to enjoy calm and stress free lives. Use medicated shampoo to treat seborrhoeic dermatitis of scalp also it can be noted that the shampoos that are made to treat dandruff can do wonders if you have mild eczema. Keep yourself hydrated to manage and control the symptoms of eczema. Eczema on legs can cause discomfort and be one of the most embarrassing skin conditions. Circular, flaky, red patches of skin can b clearly characterised on the lower legs of the ones having eczema. Eczema can be a long term problem, however, treatments can help manage and control the skin condition. Some people develop the symptoms like small, white scars, pain, brown discoloration of the skin and more if left untreated these can worsen the skin condition. Ensure to moisturise your skin on a daily basis to lock in the moisture inside your body. You can apply coconut oil, vaseline or other oils that can help you lock in moisture inside your body and keep your skin hydrated. Eczema is a chronic skin condition that causes skin inflammation, irritation, redness and flaky patches on your body. Scratching can make your eczema worse. The allergens or irritants can majorly flare-up the symptoms of the chronic skin disorder making you frustrated most of the times. Common eczema triggers or allergens may include detergents, soaps, cosmetics, fabrics, and fragrances. Patches of red, flaky skin can be seen in the abdominal area making it quite discomforting to allow even a touch of fabrics on them. 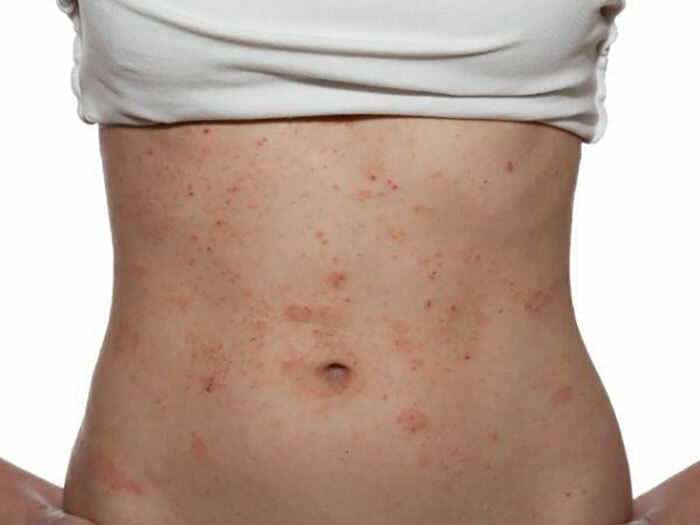 Eczema is although, not so common on the stomach as it’s on the face and limbs but it can occur as the condition worsens. Lip eczema occurs on or around the lips that lead to irritation, redness, skin inflammation, dry and flaky skin. While there is no cure for lip eczema, the condition can be managed by following the medications prescribed by the doctors. Ensure to get the patch tests, allergy tests done before reaching out to any conclusion. The irritants may include lipsticks, lip balms, cosmetics or creams applied on the lips. The condition may worsen if not taken proper care at the time when the symptoms just appear. Ensure to consult your doctors before starting any medications or change in daily regime as each individual’s body is different and the medications may be changed from person to person. Beat your eczema with Eczema Tracker App ! !